Our Wood-Guy, Wayne, just lives to invent stuff!!! 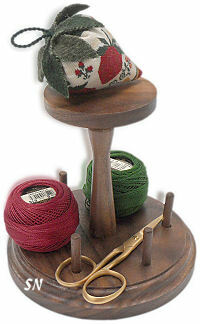 Here's his latest creation -- a little stand for your pattern, scissors, needles and threads! Made of oak, he's got the whole thing smooth and well balanced, I'd say it weighs about 12 ounces... maybe a pound. Measuring 8 inches long, 4 inches deep and 7 inches high... it has that back bar to hold up your pattern, and an angled slit in the base in which you can perch it. If you have a small Snippet by Lizzie Kate or similar pattern, that slit will hold it open for you. The pegs are there for you to lasso your scissors over and loop threads. See the little micro-super-magnet embedded in base? That's for needles! Only thing it's missing is a recessed area for those M&Ms!!! (I bet we can get him to add that later on!!!) VERY handy little caddy!!!!!!!! Doodlin' Around has the coolest lap/table frames, very easy to use and gentle on the tabletop or the clothes on your lap! Offered in three different sizes, you have lots of options. Basically, they consist of two rounded end pieces, 4 round knobs, and sets of dowel rods with fabric belting on them -- ready for you to attach your stitching fabric. (There IS enough room on there to get that belting strip under the presser foot of a sewing machine.) See how it stands? There is nothing encumbering your hands on the back side. Great ergonomic shape, everything about these is smooth and very heavy-duty. The MINI-MINI is approx 6 inches high, and 11 inches wide. 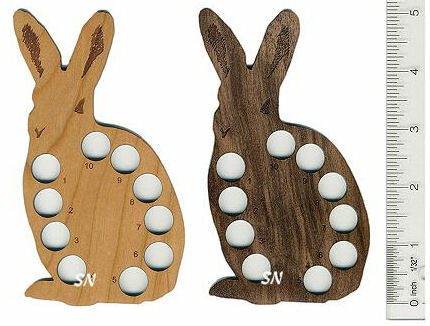 It features one set of 7-inch dowels, so your stitching area is approx 4 inches long x 6-1/2 inches across. 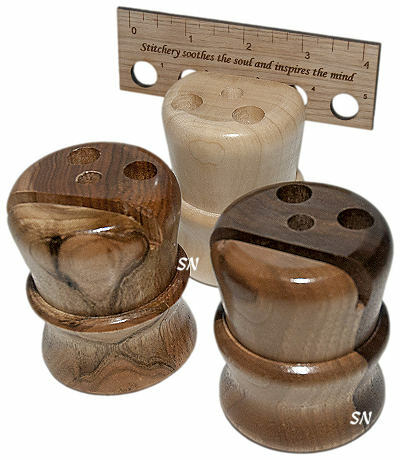 Perfect for smaller things... or skinny band samplers... you can scroll your finished stitching up around the top or bottom dowels. Next is The MINI (***NOT to be confused with the MINI MINI!) Just a bit larger, you get two dowel sets 9 and 12 inch, and since the sides are a little larger (they stand approx 7 inches high) your stitching area is approx 7 inches long, and either 9 or 12 inches wide -- depending on which dowels you use. Wonderful frames, very curvy and smooth! These are the same idea... but see how the side bars curve opposite those on the other frames? Some people like them one way, some like them the other!!! 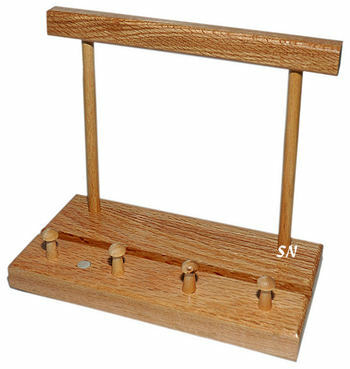 The Lap Stitch LITTLE Doodler stands about 7 inches high and comes with 9 and 12 inch dowels, one set of knobs and one set of oak sidebars. 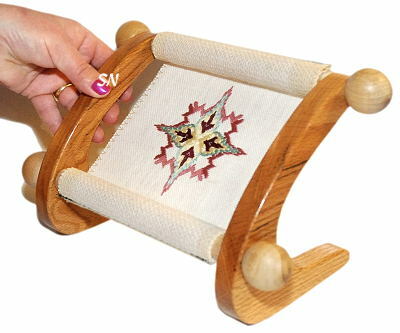 The Lap Stitch Doodler Frame is about 9 or 10 inches high and comes with 12, 15, and 18-inch dowels, along with the one set of knobs and one set of sidebars. Oh... we've been waiting for Olde Colonial to start selling these.. it is a wooden stand that showcases a favorite finished pin cushion of yours! The pegs down below can store thread balls, tether scissors, corral your thread winders, hold a thimble, or offer a safe and handy place to prop your small bag of M & M's!!! So... basically, this can be a pretty display stand, or a functional little stitching station! It measures 5 inches in diameter at the base. It stands 5 inches high, and the display platform for your treasure is 2-1/2 inches in diameter. Just the cutest thing... we perch all sorts of things on ours -- everything looks great displayed on top -- like a yummy cake under a glass dome cakeplate! Kind of like a Scissor Block -- only round! We have a new gadget that is designed to carefully hold your scissors, some needles, maybe a laying tool or seam ripper, and even a small ruler or chart. Wayne-The-Wood-Guy has a son, Greg. This is by *Greg's Turn. * It's Greg's turn to turn wood into cool gadgets for us like Wayne has for years! This little guy measures approx 2-1/4 inches in diameter and stands 3-1/4 inches high. 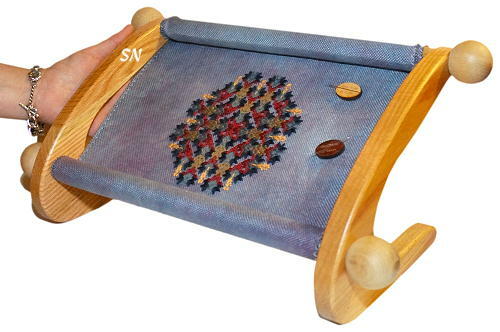 It features a felted bottom and 4 compartments, Two that are lined with felt in the bottoms that are about 2-1/4 inches deep. Store your scissors or rippers or laying tools in those holes. The bottom is soft and padded so tips are protected. The third, smaller hole has a magnet in the bottom -- that's for needles. The magnet keeps them in place in case your tower tips over. It is about 1-3/4 inches deep. 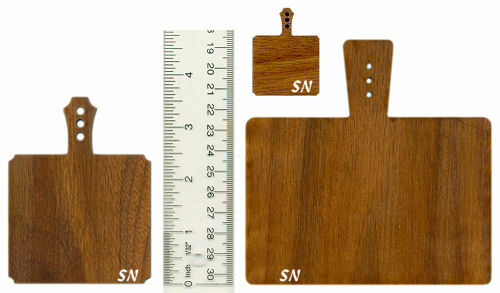 3-Inch Corner Boards - Aren't these just the prettiest little pieces of wood? 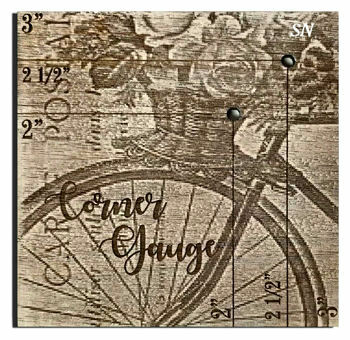 Retromantics has sent us charming 3 x 3 inch Corner Boards to help you measure that infamous *in three and down three to begin. * demand. You plop it on the corner of your fabric, and look to the lower right. The first hole puts you at in two and over two. The very bottom corner is 3 and 3. Truthfully, if you stitch much, you can pretty much gauge your 3-inch starting point. This piece is at its best when you tuck it into a pretty sewing case, or include it in a framed needle work tool shadow box. 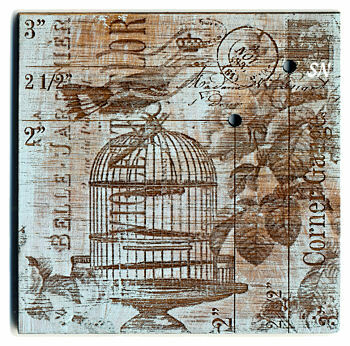 Retromantics has *Blue-Washed* the Bird Cage board, which accents the beautiful Victorian birdcage floral design they have lazored into the wood. Very pretty! Stitching by the Light of the Moon (which we know is just about impossible, but fun to think of!) 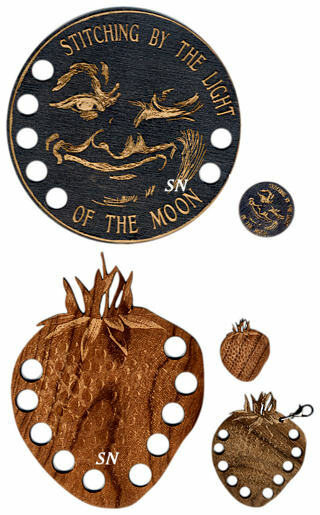 This is a very antique-inspired 5-inch round thread palette decorated with an old-fashioned man-in-the-moon laughing face etched into the wood. The verse surrounds the edges, along with 7 holes to tie your working threads. We've included a tiny 1-1/4 inch needle minder that matches! A really fun set to inlcude in a Halloween sewing case or to display along with your Fall decorations! OHhhh... we have the cutest miniature scissor blocks! 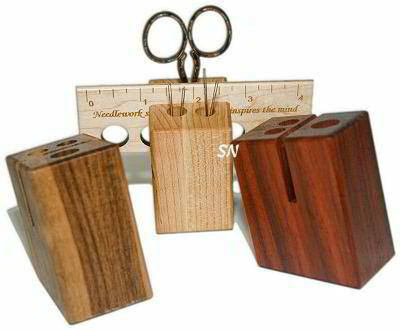 Made from assorted woods, these little 1-1/2 x 2 x 2-3/4 chunks feature a slanted top, complete with ruler slot. Along with that slot, notice the larger hole near the top? That holds a pair of 3-1/2 to 4-inch embroidery scissors. Then, notice the two smaller holes? They store needles. Each of them as a tiny magnet in their bottom -- just enough to make your needles *cling* so if the block get knocked over, no needles errantly spill to the floor. Not big, not heavy, just functional and cute! The slit can hold a small pattern, or one of our rulers or paddles that double as thread organizers. If you order multiples, we'll try to mix up your woods, but try to match ruler and organizer woods to blocks. All of these are just the coolest things! Black, red, whitewashed and brown... just a different way to finish a bit of needlework... they'd be fun perched on shelf, fun as a stitching ORT bucket, even a tray ORNAMENT on a larger Christmas Tree -- you could present something in it!! Just wanted to draw attention to these little guys as they are a nice finishing option, match them to all the different designer styles! NOTE: the filigreed whitewash tray is simply too fragile to ship, so we have taken it out of our shopping cart. Sorry! It is still available in the shop for hand-carrying home! Does your stitching basket or sewing case need a palette to hold a current project's thread collection? This simple rabbit outline, decorated with just a few 'scribbles' of definition is immediately recognizable as a cute bunny that would look great peeking out from a sewing case pocket! *Needlework soothes the soul and inspires the mind* is the advice offered on one side of these 4-inch thread organizers... while *The Silver Needle* is the other advice for good living on the other side! Measuring 1-1/2 inches x 4-1/2... your calibrated ruler includes 5 holes to loop threads for works in progress. It slips into the slot of our miniature scissor block, so even if you have no threads looped on it, the ruler is still there... and it's stored neatly in your block. Pretty Handy! 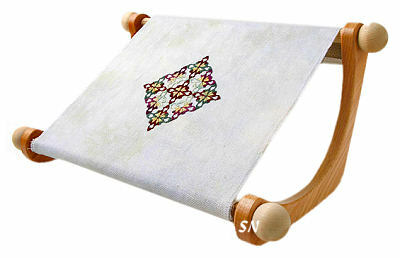 From K's Creations, this is a cool, collapsible foot stool that's just the right size for us stitchers! Raising your feet a little off the floor can take so much stress off your lower back... you'll be amazed! 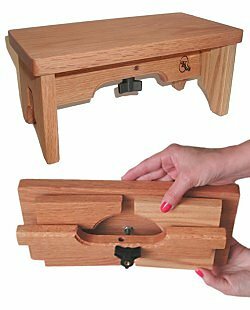 Easy to fold up and tuck into your tote bag, this smoothly finished oak stool measures just 5 1/2 x 11, and 5" high. The legs fold up under it, and a fancy bolt fastens them in place, making a bundle that is only 3" thick! 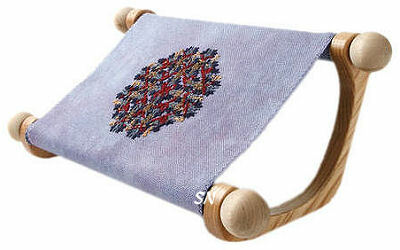 It takes 2 seconds to unfold... and is just the right size to tuck under your feet while you're stitching! Perfect for stitching weekends, traveling, whatever! 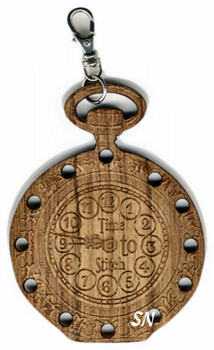 I love this antiqued pocket watch design! 2-1/4 wide by 3-inches high, it again features 12 holes tor a few of your threads. Another treasure that comes in and out of our doors -- enchanting! Our shop logo is featured on that back of this -- very small, engraved just like the design on the front. Webmaster's Note: We have some of these delightful wooden goodies for you on Accessories, Gifts & Gadgets, page 4 and more on our Exclusives page. Check out both pages to see them all!